This new application is available for iPhone and iPad at Apple Store or for Android at Google Play. Key Features include the option to search accommodations, restaurants and attractions based on your location and interests, search our calendar of events and trip ideas for your visit, or order a travel guide, sign up for our newsletter and stay in touch through social media. Main navigation includes Play, Dine, Stay, Favorites, and a More section with a treasure chest of tips and tools to make trip planning easy! 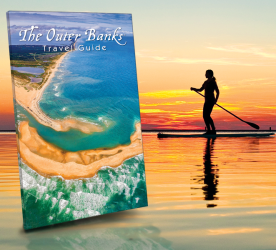 The Play section helps you to get the most out of your time on the OBX, with information on events, things to do, tours, beach and sound access locations. 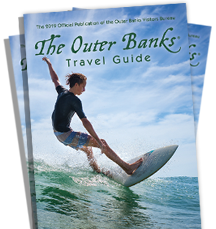 The Outer Banks is an outdoor-lovers’ paradise with more than 100 miles of uncrowded beach, quick access to off-shore charter fishing and some of the best surfing, kiteboarding, free-diving and windsurfing imaginable. The OBX also lays claim to some of the country’s most significant achievements as commemorated by three National Park Service sites. You’ll see where the Wright Brothers first flew and where England first attempted to colonize in the New World. Visit four lighthouses, including the country’s tallest brick lighthouse at Cape Hatteras. There’s so much to do, we’ve organized the activities by land, water and air. And with all that action you’re sure to build an appetite! The Dine section has you covered. Search by distance or by cuisine, the choice is yours. And talk about choices! The OBX is known for hundreds of individually-owned, non-chain restaurants. Everything from fine dining to sandwich shops, coffee and breakfast to pizza. 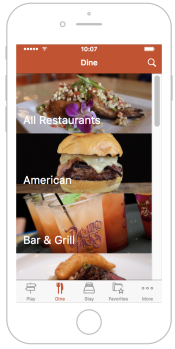 Want to just search the restaurants serving seafood? No problem. Need a place that’s kid-friendly? 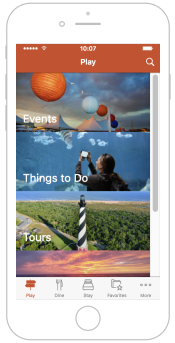 Kid-friendly has its own category on the OBX Travel app. Find directions, descriptions, websites and contact info, all in one place and all designed to make it easier for you. 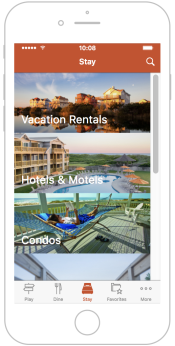 The OBX Travel app also means the perfect place to stay is close at hand, oceanfront, soundfront, mainland…from spectacular rental homes to romantic B&Bs, cottage courts to campgrounds, hotels and motels to timeshares. 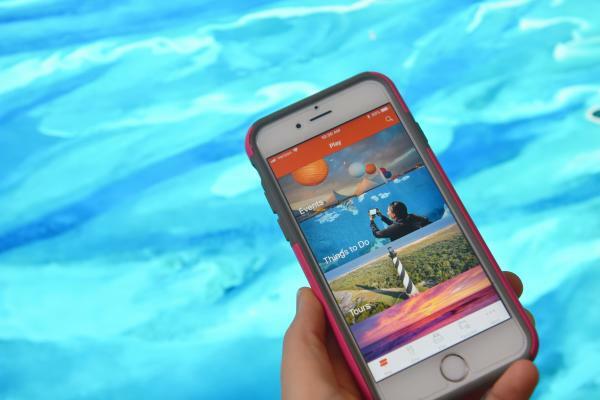 The OBX Travel app will help you find the best spot for you and yours. 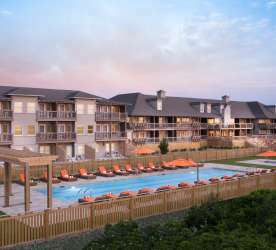 The Outer Banks’ extensive range of vacation rental homes allows you to share plenty of moments together with the entire family, but still have your own space to rest and reflect. Lodging can be viewed by type (vacation rental, hotel/motel, etc), alphabetically or by distance from your location. 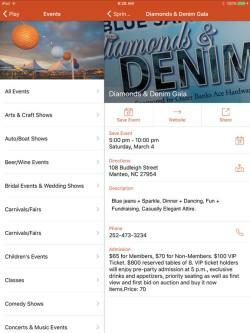 With the handy Favorites section of the OBX Travel app, you’ll be able to quickly re-locate the businesses and activities you flagged previously. This makes planning a breeze, and puts your mind at ease that you don’t miss something of interest. The More section provides inside tips on getting here and around, how to contact or message us, and most importantly, how to share your photos with us on Social Media. 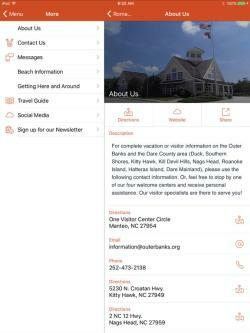 We are here to help start planning your vacation, so follow the below links to download our OBX Travel App today.